Insidious was one film that was high on my list of priority to view at SXSW. Essentially a haunted house genre movie, the film is from writer Leigh Whannell and director James Wan, who previously worked together on Saw. No worries, this film is more carnival fun-house ride than house of horrors. I mean that in a good way. Wan keeps the gore to a minimum, and the film is more campy than truly frightening. It’s still a darn fun ride, in the vein of Drag Me to Hell. The jump scares are plentiful, and had the audience squealing and screaming, but you won’t lie in bed at night pulling the covers up under your chin. It’s quickly forgotten as a fun diversion. Young couple Josh (Patrick Wilson) and Renai (Rose Byrne) have just moved into a big, creepy house with their three children. Josh is pretty oblivious to just how stressed out Renai is, what with caring for three small children and settling into this huge house. You could even say she is (understandably) emotionally unstable. Since he struck gold back in 2004 with Saw, James Wan has taken the horror world by storm. Continuing in that trend, his next major film in the genre, Insidious, is finally making some buzz with it’s first trailer. Starring Watchmen’s Patrick Wilson and Damages’ Rose Byrne, the film is an interesting take on a child’s possession. Here’s the full synopsis. 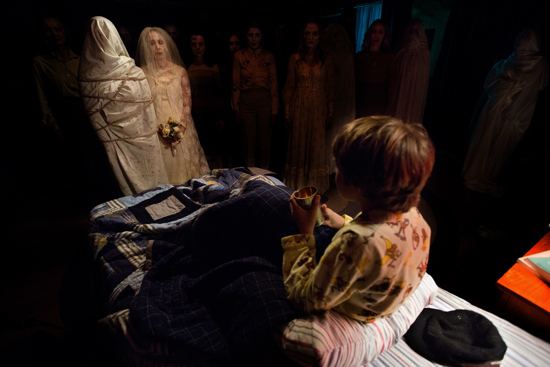 INSIDIOUS is the terrifying story of a family who shortly after moving discover that dark spirits have possessed their home and that their son has inexplicably fallen into a coma. Trying to escape the haunting and save their son, they move again only to realize that it was not their house that was haunted. The first trailer finally hit for the film, which is set to release on April 1st, and needless to say, it’s pretty haunting inside of the 51 seconds we’re given. Check it out after the jump, and be sure to catch Insidious in theaters this April. The horror film Insidious will be making its world premiere at the Toronto International Film Festival (Tiff) this week. Screenwriter Leigh Whannell penned several of the Saw films, and director James Wan directed two of the earlier Saw movies. With a title like Insidious you expect this movie to be super creepy. The clip delivers on that expectation. Watch the clip entitled, “What is it?” after the jump.